Seminar gave attendees a look at how Everglades was able to take a 45-foot boat from a sketch to a finished product in six months. 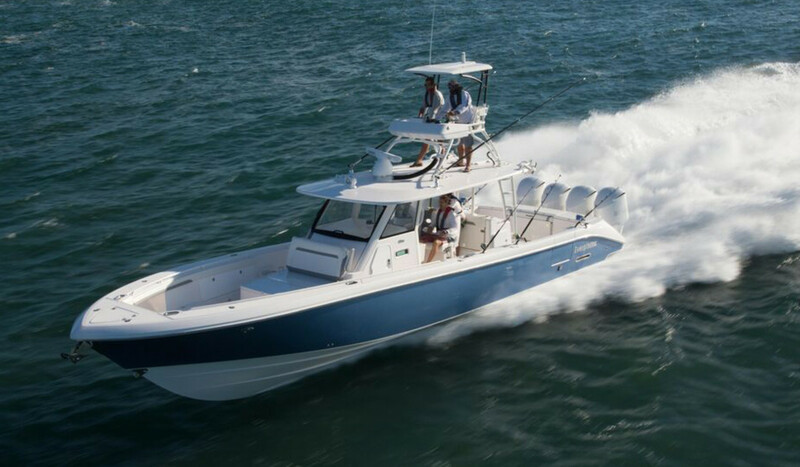 Everglades Boats took the 45-foot Everglades 435cc from a sketch to a finished product in six months. LOUISVILLE, Ky. — Seminars are a major component of the International BoatBuilders’ Exhibition & Conference, and a case study of the hyper-organized and super-speedy six-month design-to-production path of the Everglades 435cc was one of the highlights of this year’s Design & Engineering seminar track. “Critical Path Product Design: Case Study of the Everglades 435,” gave seminar attendees a microscopic look at how Everglades was able to take a 45-foot boat from a sketch to a finished product in six months. Early sketches were time-stamped in the spring of 2014 and the boat debuted six months later at the Fort Lauderdale International Boat Show. One Design’s Dan Mielke decided to present a case study of the tight window of development for the Everglades 435cc. The seminar was designed so others could see how the project got done and how they might be able to do it, Porter said. “From the beginning, [Everglades’] owner was onboard. He looked at the competition and knew what he wanted,” said Gregg Inscore, who was head of engineering at Everglades during the 435cc project and is now with GCI Designs. Inscore, Mielke and Everglades industrial designer Joe Flota presented the seminar. Next, specifications from the market analysis were used to see how the new boat could compete against what was already in the market, he said. 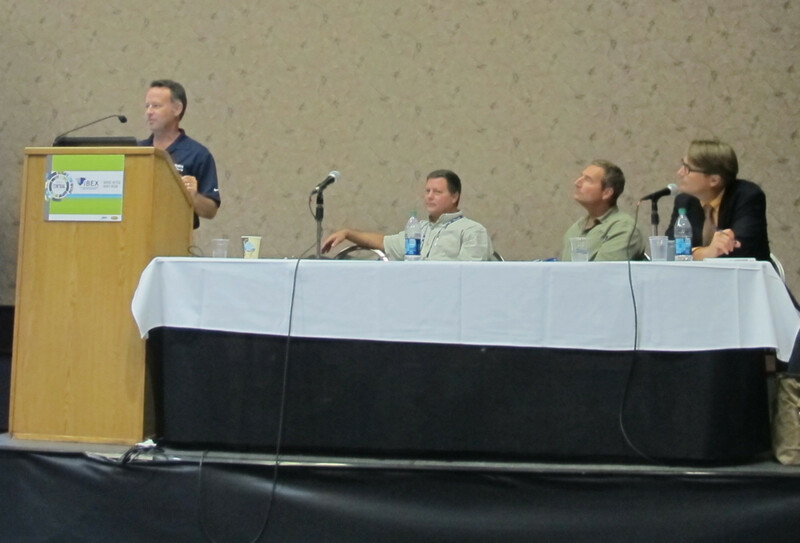 Everglades Boats industrial designer Joe Flota speaks during an IBEX seminar on the design-to-production path of the Everglades 435cc. To his right are Gregg Inscore of GCI Designs; Dan Mielke of One Design; and Aaron Porter, editor of Professional BoatBuilder magazine. “We were moving quickly to get the [Initial Graphics Exchange Specification] files to the mills,” he said. Inscore said the collection of details at the beginning of the process, such as sizing for the production facility, transportation permits, weight estimates, preliminary center-of-gravity calculations and the trailer’s dimensions for shipping were crucial to the success of the project. Flota described each crucial step of the design process and showed the development of the boat through a series of slides with detailed sketches. Mielke provided background on Everglades owner Bob Dougherty and Dougherty’s reasons and incentives for the project. Mielke described the boat deck as the critical part of the project and described the need to get the dimensions and configurations correct. Getting everyone involved and getting them to know as much about the boat as they can helps them to be confident in the boat, he said. The design and production presentation was part of IBEX’s Seminar Series, a series of 55 seminars organized by Professional BoatBuilder magazine and produced by Professional BoatBuilder, the American Boat Builders & Repairers Association, the American Boat and Yacht Council, the National Marine Manufacturers Association and the National Marine Electronics Association. The seminars follow six tracks: Boatyard and Marine Operations; Composite Methods and Materials; Design and Engineering; Manufacturing Management and Policy; Marine Electrical Systems; and Onboard Systems. Professional continuing education units are available to those who attend and participate in the IBEX seminars.